Star World has been pushing the two-hour Terra Nova Singapore premiere on TV tonight like crazy. From the ticking countdown clock to the continuous promo screaming "The biggest show in TV history!" 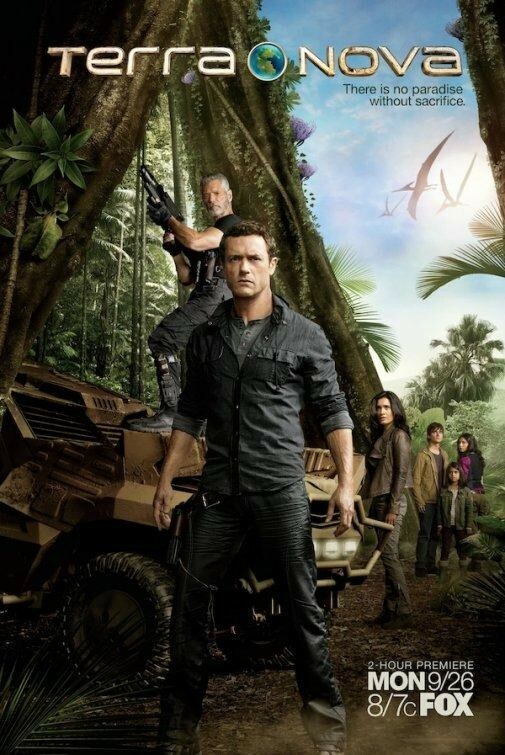 -- makes you wonder, what's so exciting about a show that looks like a made-for-TV production of Lost World (not Jurassic Park mind you) that's on screen at least 5 years too late? Well, I've seen the first episode and this was waaaay before the incessant and annoying promos for the show. Should you stay in on a Saturday night to catch the premiere? Nope. Not a Saturday night, Friday, Thursday, Wednesday... you get the drift. I heard about Terra Nova because Steven Spielberg was one of the producers on the show. You would think that the man responsible for Jurassic Park would at least offer a semi-decent dinosaur movie on a TV budget, right? Erm, Terra Nova -- not the case. Here's the plot: It's set sometime in the bleak future where Earth is an utter blah and there's a new colony called Terra Nova that everybody seems to want to move to. A family, whose dad can totally pass for Will Shuster's twin brother, moves there and starts a new life. The colony's run by a military regime led by the military dude from Avatar, who probably only plays military roles coz I've never seen him in anything else. There's a rebel group and oh, dinosaurs roaming the backyard. 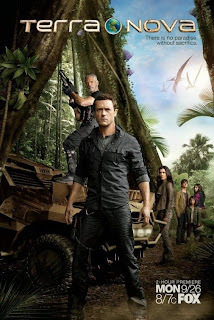 The actors are super average, completely unmemorable and coupled with sleep-inducing action sequences, I'll be surprised if the show gets renewed for a second season. It's like one of those shows that I used to watch on TV on a lazy Sunday morning back home in Penang when I was 9. Here's my thing with shows and movies featuring dinosaurs: They don't work. Jurassic Park was insanely amazing when it came out 1993 because there was nothing like it before it hit the screens. Everybody wanted to catch it. It was a must-do. I still remember standing in line with my parents, buying tickets for the movie. And honestly, growing up, Jurassic Park's the only movie I remember my parents ever bringing us to watch in the cinema. If you liked the series, do enlighten me because it's a complete snooze fest to me. Next! Service in Singapore: Hover & lurk like vultures around your customer's table, then pounce to clear the plates the moment the customer picks up the last piece of food from the plate. My favorite things: Wobble, Whoosh & Wash! I confess. I hate taking showers. Absolutely hate them. The only exception I make is when it's a rain shower and it's outdoors. Strangely though, for someone's who's so anti-shower, I love trying new soaps and shower gels -- and me being me, it needs to look good, smell really good and if it also suds well, great. In that order by the way. Which I guess is how I ended up with Whoosh, a shower jelly from Lush! 80s neon blue, green and purple things sitting pretty on a display shelf and anyone who knows me, knows that I'm easily distracted by shiny things. So I immediately picked up a sparkly, deep purple shower jelly and to my utter delight, the slippery ball of jelly wobbled away like no tomorrow in my hands! So the 5-year-old me with a salary absolutely had to get it! Instead of the purple one though, I opted for the less pretty (No sparkles!) 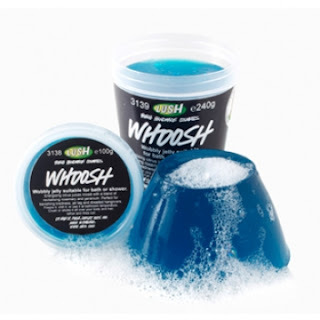 but much, much better smelling electric blue one known as Whoosh. The purple one, known as Joy of Jelly had jasmine in it, which I absolutely hate! It also had lily, rose petals and ylang ylang in it -- so definitely not my set of scents. I'm a citrus girl, so I'm totally in love with my new Whoosh in the shower -- so while it's quite an acrobatic act using a super slippery soap in the shower, I love the deep breaths of the citrus, lemon oil, geranium and grapefruit. And if I get bored, I wobble it in my hands. Yes, easily amused. So try it if you want something different from your usual soap or shower gel! Definitely a contender for my Best Ever list. Word of caution: Don't dig your fingernails into it, as it will break into pieces.